I found something very interesting out yesterday and need to share this as it is quite cool. In this article you will learn how to remotely control YouTube on your PC with a smartphone or any other mobile device. And this is much more easy than you might think! I will explain it in detail but if you don’t want to read too much then head to the “too long to read summary” at the end of the article. I can’t tell you how much I love to browse and watch videos on YouTube because you can find so many interesting videos there. I have a big enough computer screen so that it is totally cool to watch and enjoy the videos with that screen. My computer is not too far away from my couch and if I wanted to watch YouTube videos for a longer time for example in the evening before going to bed, I would usually arrange my living room couch so that it is cozy for me. I can look in the direction of my computer screen from the couch, however, the problem was always that I would need to use my keyboard and mouse to browse, which means I had to stand up from my cozy couch when I changed the videos or while browsing through YouTube. Here is what I found out and what you will learn in this article, you will learn to use your mobile device as remote control for YouTube that is running on your PC, so that you never have to leave your cozy couch again while watching YouTube videos. If we didn’t already, we should install the official YouTube app on our mobile device. If you are using any Android device you will find the YouTube app for Android in the Google play store on your device or with this link. If you have any iOS mobile device, then you should install the YouTube app via iTunes or check out this link. Talking about our PC, we do of course only need a web browser. As a Firefox user I was sad to find out that it doesn’t work there and I didn’t test much other browsers but I also have Google Chrome installed as second web browser and there it would work just fine. So, this is important, we need to use the Google Chrome browser to make this cool idea working (EDIT: A commenter said it works with Firefox too, so, maybe one of my extensions did prevent it to work). If you don’t already have it installed on your PC, download and install Google Chrome now. YouTube has a special web address that is made for modern TVs. The web address is youtube.com/tv and it is a special user interface that allows to browse easily through YouTube with a modern TV. However, we can of course also open this address with our PC browser and that’s what we will do, we just need to open the address with Google Chrome. In the easy to understand YouTube TV interface we will now search the login and settings entry in the menu, it’s easy to find, it’s the entry with the cog-wheel symbol. We will open this menu and find another entry that allows us to pair or connect our mobile device with YouTube on Google Chrome. YouTube tells us on the screen that we should visit youtube.com/pair but that is not important, but the code of numbers below is important because we will use the shown number on our mobile device. On our mobile device we should start the YouTube app now. This is probably different depending on what kind of mobile device you use, but in the YouTube app you should now use the pushbutton that you usually use to access the settings in different apps you are using. A small menu should appear in the YouTube app where you push on “settings” and the next menu appears where you just open “Connected TVs” and there you use the entry “Add a TV”. 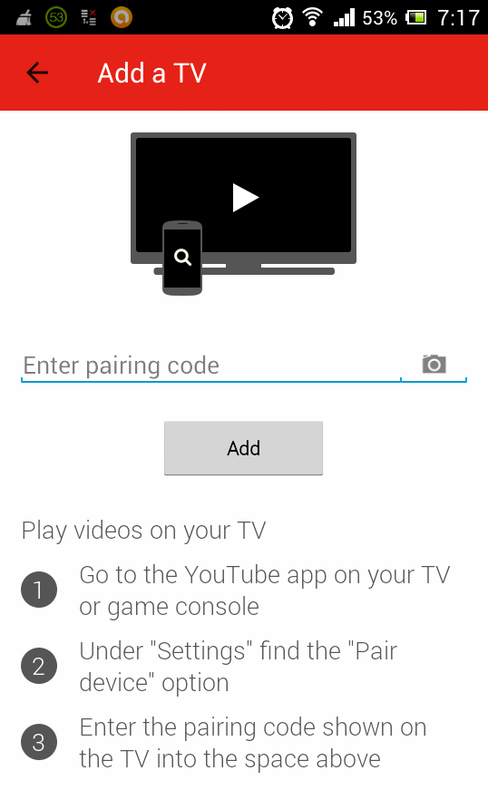 We will now see a screen in the app that is asking us for a pairing code, the code that we see in the settings of the YouTube interface we opened with Google Chrome. We just have to type that code we see in the YouTube TV settings in Chrome into the pairing code field of the YouTube app on our mobile device now. 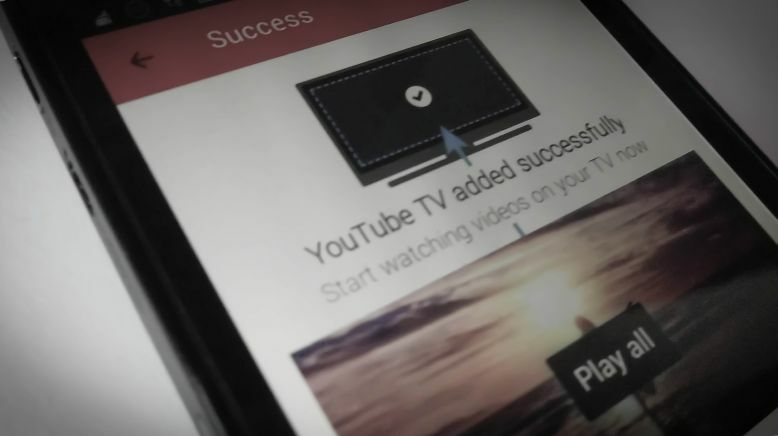 Once we used that code in our YouTube mobile app, we will see a screen on the mobile device that tells us “YouTube TV added successfully” and we can now start browsing on YouTube with our mobile device and the videos will be played in our Google Chrome browser on the PC. Small extra tip, just use the F11 key on your PC keyboard and Google Chrome will be full screen, which means you will only see the videos and no borders of the Google Chrome browser. You are now ready to browse through YouTube for hours on your PC and you don’t have to touch your PC mouse or keyboard anymore on your journey. Just lay back on your couch and use your mobile device as remote control for YouTube on your computer and have fun! 1. Install the YouTube app on Android via Google play store or iOS via iTunes shop depending on the system of your mobile device. 2. Download and install Google Chrome on your computer if you didn’t already. 3. Open the address youtube.com/tv with Google Chrome. 4. Find the settings cog-wheel in the YouTube interface we opened with Chrome to pair or connect a mobile device and notice the pairing code. 5. 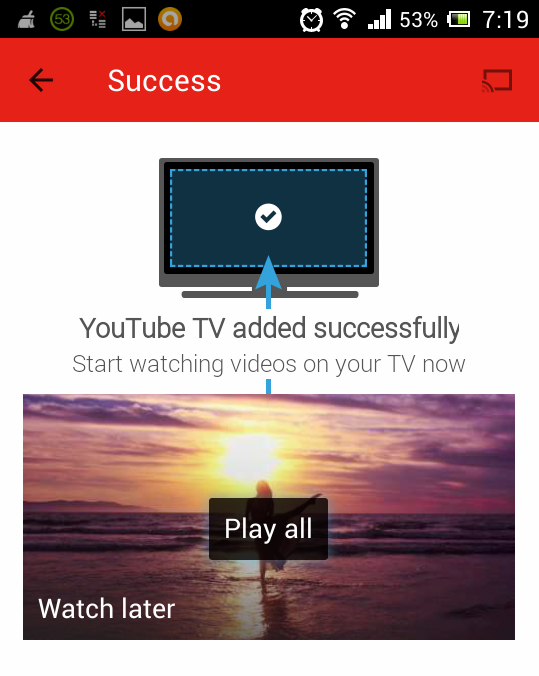 Open the YouTube app on your mobile device and open the app settings and open “Connected TVs” and “Add a TV”. 6. Use the pairing code you see on Chrome to type it in the field you see in the “Add a TV” settings in the YouTube mobile app. 7. Done! Happy video journey with your new mobile device remote control for YouTube in Google Chrome on PC! Note: Removing the device is possible via both, the YouTube app settings and the YouTube TV interface in your browser as it seems. I hope this guide was helpful, let me know in the comments! Thanks for letting me know, then it maybe didn’t work in my case due to any firefox extenstion I am running. I will test this out again. Thank you! Nicely broken down. But this year, this procedure is invalid. Does anyone know what is the procedure for this year?